Any video edition always needs the best sound. From our advice offering professional audiovisual solutions, in this case we recommend one of the best digital audio workstations in the market. 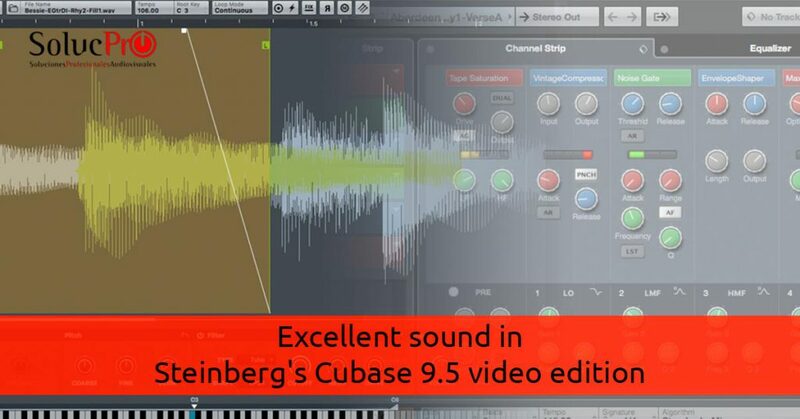 Cubase 9.5 by Steinberg is a kind of software perfectly prepared for music professionals. Therefore, we speak of a tool that will provide excellent sound in the editing of our video. If we talk about DAW, or what is called, digital audio workstation, we have to talk about Cubase 9.5. The most complete in the market for its benefits and the experience that supports it. Its impeccable sound quality coupled with a cast of versatile and intuitive tools, makes it the favourite of: producers; sound engineers and, of course; musicians. It is rich and fluid from composition of soundtracks to own productions. Therefore, we speak of exceptional software for sound. If you are looking for a demanding video sound edition with the highest quality, Cubase is your choice. As official Cubase distributors, we can guarantee some features and benefits of this DAW. An excellent soundtrack will always accompany any audiovisual project you make. This digital audio workstation is designed for any user whatever their project. Either for someone who has just started in sound production or for someone experienced in the music industry. Proof of this is that even Hans Zimmer, awarded prizes for his brilliant soundtracks of Gladiator and The Lion King, uses this powerful software. Since 1989 with the first version, Cubase has managed to innovate and advance always adapting to the latest technological demands. Experience and confidence guarantee their trajectory in which users around the world trust. It features the most innovative digital audio engine to meet the demands of all types of work. It is an audio processing with the best technological guarantees that, in addition, develops a work of compatibility for other platforms such as Windows, MacOS and iOS devices. Not only is it important that the technology is reliable, but also up to date to meet the demands of its users. And that’s precisely what Cubase is concerned about. For example, with the update of iOS by Apple, since June, Cubase iC Pro was relaunched to download directly to these devices after solving old problems. This solved several compatibility failures after performing the corresponding tests to certify it. In addition, it incorporated solutions and improvements requested in several areas of the application. Besides that, they have recently released the full educational download versions of Cubase 9.5, in their eagerness to always keep the best updates for their users. Remember that from SolucPro we always bring you the best selections of professional video and audio for your work. For those videos more demanding in the sound aspect, SolucPro also recommends the best products.